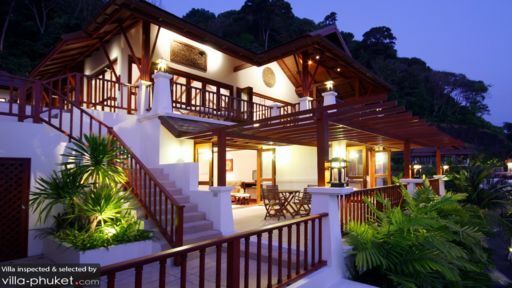 Villa Laelia’s prime hilltop location in Patong guarantees uninterrupted vistas over the Andaman Sea and out to the surrounding greenery, along with a sense of serenity you’d be hard-pressed to find elsewhere in the bustling town. Featuring four bedrooms and capacious communal spaces, the villa is ideally kitted out for sharing among travelling parties of eight. Guests also enjoy access to shared amenities in the L'Orchidee Residences estate, which includes a clubhouse, pool, children’s pool, gym with sauna and entertainment amenities. Four bedrooms are spread out over the compound. A stairway from the main living area leads to three bedrooms: two are sea-facing master suites complete with king beds and en suites with whirlpool tubs, while the third features twin singles and an en suite with shower recess. The fourth bedroom, located away from the main building behind the pool features a king bed and private en suite with shower recess. A sparkling pool with jacuzzi overlooks a stunning landscape: during the day, it’s clear blue skies and the glistening Andaman Sea; after nightfall, you’ll enjoy expansive views of the glittering Patong skyline. 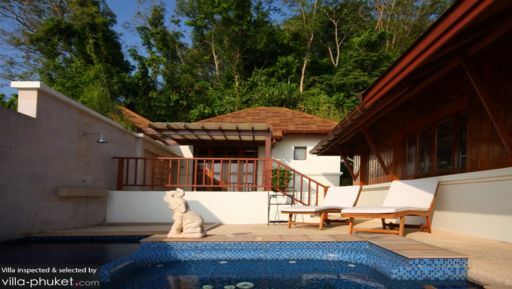 Recliners set out on the deck lets you soak up the Phuket vibes by the poolside. A breezy, sunlit terrace comes outfitted with an eight seater dining set for al fresco meals. Lofty and light-filled, the living spaces at Villa Laelia feature high ceilings and bi-folding doors that bring the outdoors in. The décor is modern with contemporary furnishings and a simple colour scheme, yet it retains a traditional charm with Thai-style design elements and home accessories. Much of the socialisation takes place in the living room, which comes outfitted with sofas, cushions, a coffee table, 42-inch plasma TV with DVD player and sound system. It adjoins a dining area that comfortably accommodates up to 10 guests, and a fully equipped open kitchen. Airport transfers, along with housekeeping, security and personal guests services are included with your stay. Guests are entitled to a free shuttle bus service that runs between your villa and the estate entrance. Guests also enjoy access to shared amenities at L'Orchidee Residences, which includes a clubhouse, swimming pool, kid’s pool, gym with sauna, convenience store, pétanque pitch and pool table. Featuring a spacious pool deck, barbecue facilities and spectacular coastal backdrop, the clubhouse doubles up as a great venue for pool parties and events. The on-site team will assist with event setup and catering. Bustling Patong boasts a vibrant dining, shopping and nightlife scene. From trendy beach clubs to sprawling shopping complexes and seafront bars, there’s no lack of local amenities and entertainment for villa vacationers. Patong Beach, located 10 minutes’ walk from your villa is home to numerous seafront dining venues. There are great options away from the coast too, like La Gritta (our to-go venue for Italian food), Lim’s Restaurant, Le Versace and Wassa Homemade Bar. Surf House, Flying Hanuman and Phuket Wake Park are popular family-friendly attractions, as are sightseeing spots like Radar Hill Viewpoint, Big Buddha and Old Phuket Town. For ultimate relaxation, unwind with a spa ritual at luxury spa venues like Aqua Spa (at Avista Hideaway) or the Thai Spa at Swissotel. Location Location Location! 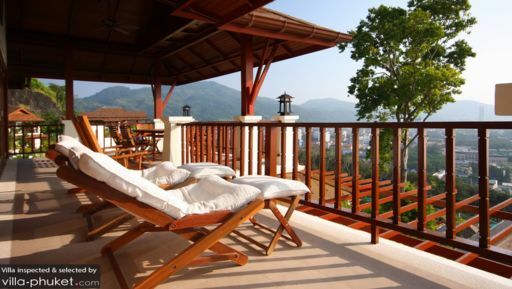 This Villa is the perfect spot within patong! Away from the Hustle and Bustle but only a 5 min Tuk Tuk Road into the heart of Patong. We absolutely loved the location it was just perfect! The daily breakfast was delicious and on valentines day we even had heart shaped fruit! ADORABLE! The Infinity pool was warm and great to relax in after a day of shopping and watching the sunset over patong city was just breath taking. We stayed here with 3 other couples and 5 children / babies and it could not have been better suited to us. Plenty of room with amazing views over Patong. Location was great, with the tuk tuk service to pick you up at your door to take you down the hill to either walk or get the public tuk tuks into Patong. Far enough away from the craziness to relax, but close enough to get amongst it if you wanted to. Will definitely return!